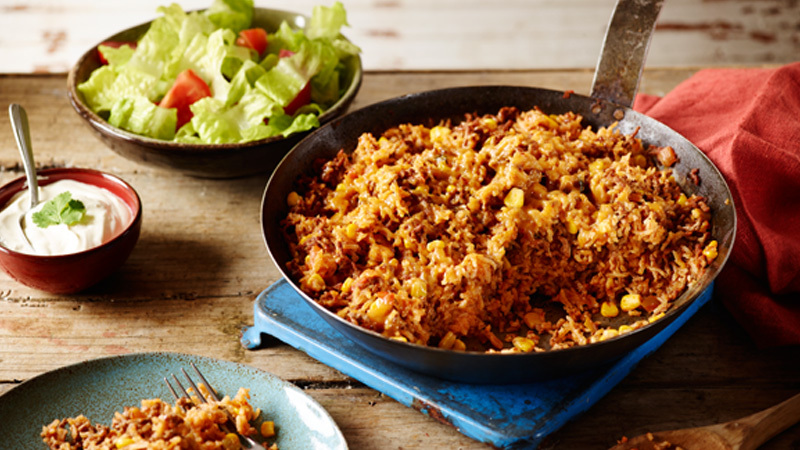 A one-pan Mexican dinner ready in 30 minutes! 1. Heat oil in 24 cm deep frying pan over medium heat until hot. Add beef mince, cook 5 to 8 minutes, stirring occasionally, until cooked. 2. Stir in taco seasoning mix, rice, water, salsa and corn. Bring to a boil; cover and reduce heat to medium-low. Cook for 12 to 15 minutes, stirring once to check that rice isn’t sticking to the bottom. Remove from the heat and let stand 5 minutes. 3. Fluff the rice mixture with a fork and sprinkle with the cheese. Cover and let stand 1 to 2 minutes or until cheese is melted. Serve with the lettuce, tomato and sour cream, if desired. Make into a burrito by rolling up into tortillas with some extra salsa, and the sour cream!